This portrait of an artist struggling to find her place in the music industry largely succeeds off the back of its measured and deft lead performance by Illeana Douglas. Loosely inspired by Carole King’s life and work we trace Denise Waverly’s career across the 60’s and 70’s as it mimics the highs and lows of the times. Douglas brings something very genuine to her role here; often having to work with relatively little she makes every moment count and guides us through a real raft of emotional places, reminding us of how underrated an actress she really is. This is her film and she works every scene with nuance and intelligence. What plays against her is the film’s lack of focus. It’s a hard trick to summarise two decades worth of change and culture on film; either you go big with an ensemble cast ala Boogie Nights or you could try and set up two parallel narratives in different time periods as Love and Mercy did earlier this year. Here when you’re focused on one character in a movie that lasts less than two hours you find that the film is spreading itself too thinly to give a compelling character piece and a portrait of its times. Although it does a respectable job of both elements one cannot help but feel that this would have been all the more powerful had it focused in a little more on the Waverly character over a shorter time span. 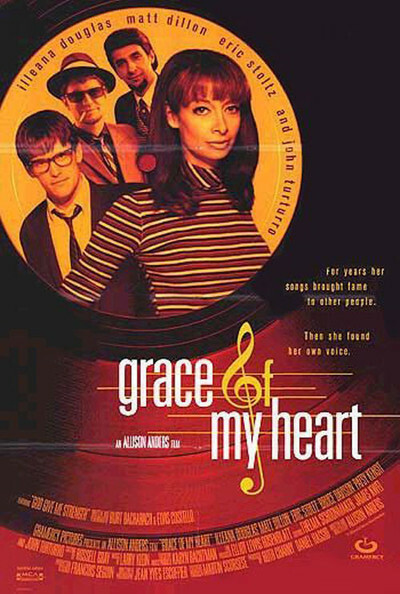 Despite this central flaw Grace of My Heart is still very much worth watching, not only for its excellent lead performance and the generally good quality of music composed by the likes of Elvis Costello but also for its strong supporting cast. Amongst others we have memorable performances by Eric Stoltz, Matt Dillon and John Turturro, all of whom bring something of their own to the film and enhance it in unexpected ways. With an intelligent script, great cast and promising direction this film should be a real success. It’s lack of focus and slight repetitiveness do drag it down from being excellent, but there are still plenty of gems to be found here. Grace of My Heart is released in the UK by Odyssey on the 12th October on DVD – get it online and in all good retailers.